As had been widely expected, due to the southernness of the totality track and Asia's monsoon, only a fraction of the hundreds of millions living in the zone (or of the tens of thousands who came to visit) actually saw the total solar eclipse on 22 July 2009, though all got to experience often over five minutes of darkness. The deluge of pre-event stories can be found here - here is a first round-up of links five days after the event that won't be topped in length until 2132. 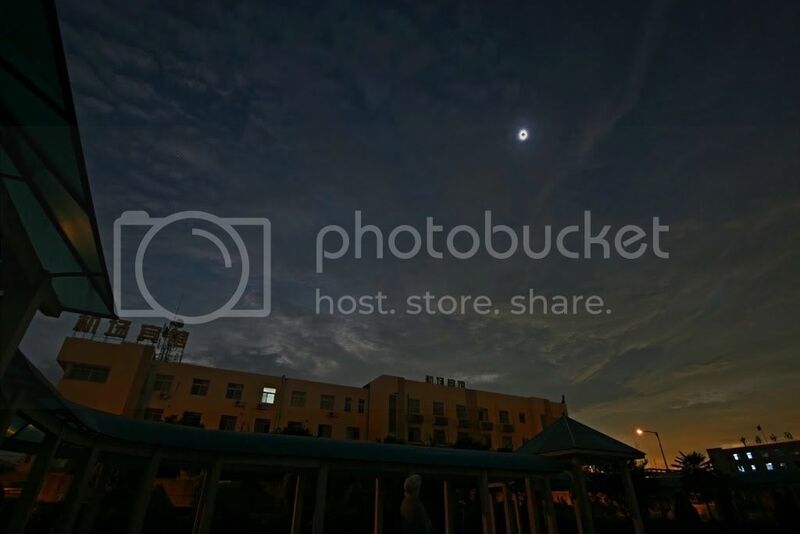 As will be seen, clear views were abundant especially around Varanasi in India and between Chongqing and Wuhan in China, though isolated spots in Eastern China also had good views - with the notable exception of the mega-city of Shanghai where it rained during totality. Out in the Pacific there were also successes. Particularly recommended links in the following collection are in italics! From Varanasi (where the clouds cleared just in time) we have a stunning multi sequence, the corona, a picture sequence, another and another one as well as an AFP pic (another and another one), a news story and early and later and detailled reports. From other Indian places come reports from Surat and from Bihar (also a long article and a picture). Also a news story from an eclipse flight (another, another, another, a report, a blog report and a press release) and another scientific two. And more coverage of the eclipse in India in general here, here, here, here. From Nepal we have a a blog report, from Bhutan another a blog report and a totality pic and from Tibet some pictures & links. 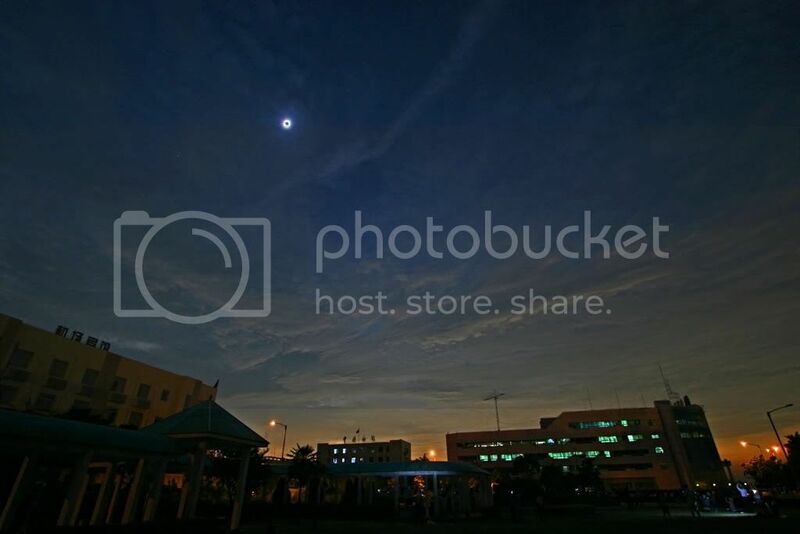 From Chongquing or nearby come a report w/pics, the diamond ring at 2nd contact, a wide-angle view during totality and a Xinhua pic. From or near Yichang we have a long story w/pics in Spanish, a report in English and a quoted tweet, while from Changsha a Reuters pic came. From Wuhan we have a striking wide-angle view (another and another one), corona composite (another one) and more pics, a picture series, a Flickr Stream, another picture series (100 km SW of Wuhan) and more pictures of Baily's Beads at 2nd contact, a hazy and a pretty clear corona, a wide-angle and a fish-eye view during totality and the inner corona & prominences close to 3rd contact. Plus a 9-min video and CCTV on public reax. From Huangzhou come a blog report, from Anqing a picture series w/prominence detail and a report and from Huangshan a blog report and a corona. From Tianhuangping - site of a major scientific expedition from the U.S. - we have a Williams College Press Release, a NYT blog (note the earlier posts linked there; also this and this one) and fine corona pictures. From Anji come a corona pic, more pics and a wire report on successful Indian experiments there, and from Hangzhou we have a nice contact picture and another picture plus a German radio report. From Wuzhen - where yours truly was located - we have my pictures and reports and more from the same site by B. Brinkmann and K. Schulze-Frerichs as well as a video clip of 2nd contact. There are also some impressions from Water town west with a video clip, an i-report and a TwitPic. From Jiaxing come an Austrian media story, from Suzhou pictures and a German blog entry and from Sheshan a U.S. magazine's report (by a Shanghai blogger). From rainy Shanghai little of substance was found other than a wide-angle view of the dreadful sky, a German newspaper's account and a confused blogger's (another one). From cloudy Yangshan a report. From large unsuccessful Jinshan on the coast we have a long, a short, another short and a German blog report, some some pictures without and some with the corona and a long slide show. From over the Hangzhou bridge come a report, from Ningbo a Univ. of Nottingham Press Release, a blog report and another one with a video and from Putuoshan island a picture series. From Japan we have a blog report from Tanegashima and a picture collection. From the ill-fated Costa Allegra ship comes a blog report (and there's a comment on that cruise). From the Marshall Islands we have a report w/pics from Enewetak and a Radio NZ story, from the Northern Cook Islands a great picture of the low Sun (also see the others in the stream) and from Kiribati a report w/pics and another one. From space come to us a dramatic shadow movie from MTSAT-1R at slow pace as well as pretty hectic, plus two still images of the shadow (also here, here, hier und hier). We also have a deep partial eclipse by Hinode in X-rays (more) and effects of the eclipse on the Koronas-Foton and Fermi satellites. From outside totality on Earth there are a video from Badaling on the Great Wall and reports from Shenzhen, Beijing (more), Xinjiang, Taiwan, Brunei, Malaysia, Bangladesh, Cambodia, Hawaii, Kagoshima and Tokyo. And from outside even partiality online impressions from Germany (earlier). Thanks Daniel for sharing your thoughts about our or rather my plan to watch the Annular eclipse in Qingdao.. I am a bit frustated as a chaser because overcast marred my first two attempts. Hopefully you can share some links regarding cloud cover. Thank you so much for this! I've been looking for accounts of successful observations and the only one I saw so far was the one with Williams College. 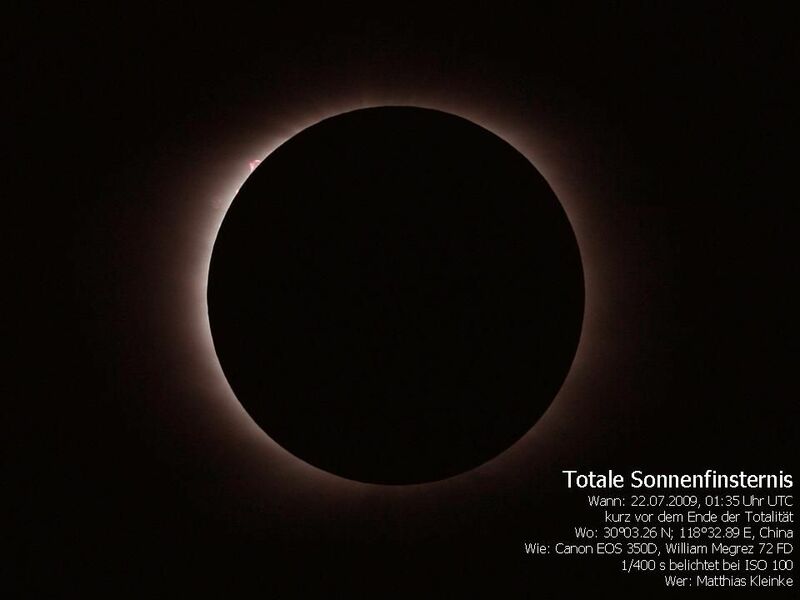 @Jodl: For weather statistics regarding the next annular eclipse, look here!